I’m styling a show at the BNTM live event! I have some uber-exciting news! As the title of the post suggests, I’m going to be styling a catwalk show at the Britain’s Next Top Model live event this weekend! Motorola are headline sponsors of the event and they have asked five super stylish bloggers (and me for some silly reason!) to style the catwalk show. I’ll be styling the high street segment with Jenny, Natasha and Frankie will be styling the vintage segment and Matthew and Alize will be doing high end. The theme of the show is geek chic in keeping with the current ‘too hip to be square’ ad campaign for the Flip Out phone. How stupendously excited am I?! As a fan of the BNTM and ANTM shows, the idea of a live event was very exciting, let alone being involved in it. Huge thanks to the guys at Motorola. The event takes place at London’s ExCel centre between 22nd-24th October, if you haven’t got tickets yet, hurry!! It sounds like a fab event, there are celebrity performances, girls from BNTM in attendance, hair and beauty pampering and shopping. Preppy geek chic – Think Blair Waldorf in season 1 of Gossip Girl, Alexa Chung and Rachel from Glee. Very proper and chic, a more sophisticated take on geek chic. 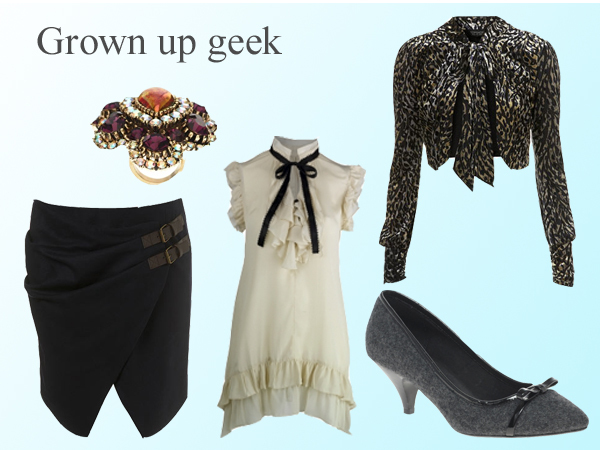 Grown up geek – A cross between a librarian and Ugly Betty (latest season), this is probably the most on trend geek look. The pieces individually are on trend but they clash slightly when together. Cosy geek – Very apt for this weather! No pop culture references for this one, just combine the cosiest of the autumn/winter trends into a cute geek chic outfit. OMG!!! wow im soo excited for you, this sounds amazing!!!! I love the looks! you'll do great babe! Wow, how amazing is that! Congratulations! From the looks you've put together in this post I'm sure you're going to do a brilliant job of styling the show!